Powered by cutting-edge ASIC technology, Genus inverters can produce Pure Sine Wave Output and supply power with consistency and reliability. Perfect for various home and heavy-duty applications, these inverters are high-performers, cost-effective, environment-friendly, and have long life. They can run sensitive electronic equipment and are well-suited for running everything from fans in homes to elevators in factories. The inverters are easy and safe to operate, can recharge batteries fast to provide long back up, and can withstand heavy power cuts. They are available in 600 VA to 100 KVA options, feature smart LCD displays and are easy to install anywhere you wish. Modern in design and based on advanced DSP technology, the Genus home inverter & UPS supply clean and stable power in a consistent manner. Perfect for households, offices, small shops and small businesses. Genus high capacity inverters provide clean, consistent and sufficient power in myriad commercial applications, thanks to the advanced DSP technology. They cause no pollution and can power up normal loads to elevators and even big machinery. Advanced DSP technology allows Genus’s commercial static UPS to produce adequate and consistent power in the form of pure sine wave output, to run a variety of appliances safely. These are ideal for large-households, commercial spaces, large-businesses etc. An essential step into the future for your home and business, solar inverters by Genus are eco-friendly, use clean solar energy to produce electricity. They switch to grid power only when solar power is not available, and ensure low electricity bills. Genus Inverters & UPS can be connected with power sourced from the electricity grid, from Solar PV panels, or fuel based generators. Inverters & UPS by Genus run on intelligent DSP control circuit and supply power that is equal to the power supplied by Grid, making it perfectly safe to run sensitive equipment. 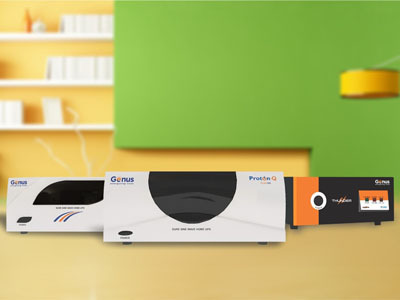 Owing to the turbo charging option, Genus Inverters & UPS can recharge very fast and are always ready to supply sufficient power reliably, even during long and frequent power cuts. 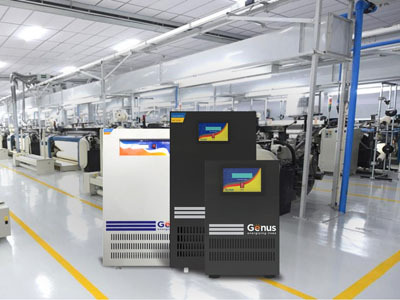 Genus inverters & UPS can endure rough weather, work perfect in low or high voltage conditions, to run all appliances, from small domestic or commercial ones to large ones in factories. Unlike a generator, Genus inverters & UPS cause no noise, no harmful emissions or pollution, and can be used safely in any environment. To provide you with a power output that matches the grid. To protect your sensitive appliances. To ensure that your back up is ready even under the worst of conditions. Auto Sense Intelligent Control to enhance the life and performance of your battery.